This show lived up to all its hype, definitely a wonderful night at the theater. The staging is absolutely beautiful, very intricate and simple at the same time, based on scrabble pieces (which makes for fun games at intermission). The cast was superb. I saw Milly Shapiro as Matilda on the show I saw, and although I was hesitant at first (my moms comment was that Matilda shouldn’t really be blond and she looked too awkward) she won us over in the end with her charm, and pretty amazing voice. Bertie Carvel as Miss Crunchball gives a master class performance (def a tony nomination and probable win waiting to happen). The performance could totally go over the top, but it doesn’t. It nuanced and contained, and has the necessary force to understand the character, but without taking it to a full caricature. Gabriel Ebert and Leslie Margherita as Mr and Mrs Wormwood were great, total sleaze personified. I think the highlight of the show is the book, its storytelling and the staging more than the music. Even so, it still has some great musical moments. I particularly enjoyed the School song, it has a very clever staging, playing with alphabet cubes and the lyrics, that you just have to watch. Matilda’s two songs, Naughty and Quiet, are really sweet and powerful at the same time. Mrs Wormwood singing and dancing Loud is the comic relief of the night. I think, what I liked the most, is how clever the storytelling was. It could have gone the obvious route, with lots of magic, special effect and flair but it doesn’t. Instead it focuses on simple storytelling, modifying the book story in such a way that you don’t need the flash and the emotional connections is what triumphs in the end. I definitely enjoyed that spin. A must watch in NY (and most likely I think the Tony winner this year). Rhetorical question relating to this: what would be its Tony number? The big musical numbers do not involve most of the cast they want to probably show off for acting awards, so I would expect a little medley come June. 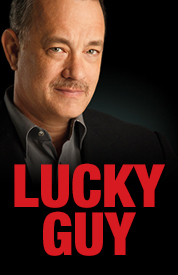 I went to see this play for Tom Hanks and Nora Ephron. Love him, loved her (I mean When Harry Met Sally and Sleepless in Seattle were some of my first movie obsessions). For tom Hanks, I was not disappointed at all. He gives a great performance as Mike McAlary, he really puts it out there on the stage, and although probably not his best work compared to some of the things we have seen onscreen, its a very committed and powerful performance. I have to say a was a bit star struck to see him live! I was also going expecting a very one man centric show and I was pleasantly surprised to find that the rest cast was as good as him! Filled with great actors (most of which you know their faces but really had forgotten their names), it is a truly exceptionally acted show. The highlight of the ensample for me was Courtney B. Vance as Hap Hairston and Christopher McDonald and Eddie Hayes. An added bonus of the cast: A Bosom Buddies reunion between Tom Hanks and Peter Scolari. The staging was very simple but completely appropriate, and I loved the fact that actors were on stage at all times, with a bar for them to “hang out” at when they were not in the scene. Nora Ephron was the part that disappointed me. Although a good piece, and very informative as a I knew nothing about Mike McAlary, I felt it could have been more engaging in its delivery. There might be too much breaking of the fourth wall, and too little interaction amongst the actors, which is a shame given how extremely talented they all were. The reviews I read the day after I saw it were quite rough, and I have to say I enjoyed it much more than what they put it out to be.